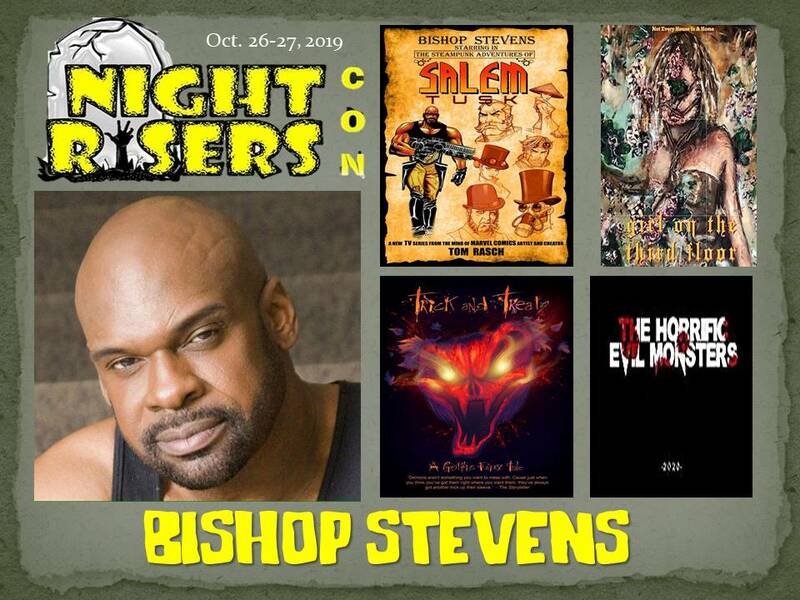 Bishop Stevens is an Actor who has appeared on some of the hottest network and cable television shows including AMC's The Walking Dead, FOX's Empire and NBC's Chicago PD. In the last few years Stevens has become known as one of the mid-west area's fastest rising movie actors landing a guest starring role on the Verizon Go90 series- Embeds with Don Tiere and Alexis Zalar, then moving into roles in major motion pictures like Nicolas Cage's-Mom and Dad, Chance The Rapper's-Slice, Colin Ford's-Addicted, a Justin Long project-The New Guy and Ellen Page's - Mercy. Read more HERE. Below, The 6th Annual Night Risers Con event featured Tony Moran, AKA Michael Myers, from the original "Halloween" movie, Actor Bishop Stevens, Author Lyn Gibson, and the replica 1982 KITT/Knight Rider Car! Don't miss the chance to meet your favorite celebrity, get a picture together or an autograph! Tickets Available Soon. Tony Moran (born August 14, 1957) is an American actor and producer. He is remembered for playing the unmasked Michael Myers in the 1978 horror classic Halloween. Since then he has gone on to make guest appearances in television series The Waltons and CHiPs. In 2008, Moran returned to acting with the short film The Lucky Break. In 2010, he produced and starred in the horror film Beg, which also stars his Halloween co-star P.J. Soles. Click Here to Read More.. The Batmobile is the fictional car driven by the superhero Batman in American comic books published by DC Comics. The Batmobile first appeared in Detective Comics #27 (May, 1939), where it was depicted as an ordinary-looking, red car. Housed in the Batcave, which the Batmobile accesses through a hidden entrance, the heavily armored, weaponized vehicle is used by Batman in his campaign to fight crime. See a 1966 REPLICA Batmobile at this years event! Allen Ray Sarven (born July 18, 1963) is an American professional wrestler, color commentator, training coach and actor better known by his ring name of Al Snow. He is best known for his work in Extreme Championship Wrestling, World Wrestling Entertainment and Impact Wrestling. From 2010 to 2017, Snow had worked as a road agent for Total Nonstop Action Wrestling and with its former developmental territory, Ohio Valley Wrestling, as a show producer. Click Here to Read More..
Bishop Stevens is a former WCW-WWE pro-wrestler who has appeared on some of the hottest network and cable television shows including AMC's The Walking Dead, FOX's Empire and NBC's Chicago PD. In the last few years Stevens has become known as one of the mid-west area's fastest rising movie actors landing a guest starring role on the Verizon Go90 series- Embeds with Don Tiere and Alexis Zalar, then moving into roles in major motion pictures like Nicolas Cage's-Mom and Dad, Chance The Rapper's-Slice, Colin Ford's-Addicted, a Justin Long project-The New Guy and Ellen Page's - Mercy. Click Here to Read More..
Lyn Gibson hails from the deep south where legend and lore run rampant and are all a part of everyday life. Ms. Gibson became a top-selling published horror Author in 2014 with her debut series title “The Adrian Trilogy”. Since then, her blog and fan pages have amassed a following that spans the globe. She is recognized as a Vampire Historian and is rapidly becoming established as a master in the horror genre. As a lover of the paranormal, Lyn harbors an insatiable craving for knowledge of beings which exist just outside of man-kind’s grasp. Click Here to Read More..
Buy Pre-Sale Tickets Now & Save!